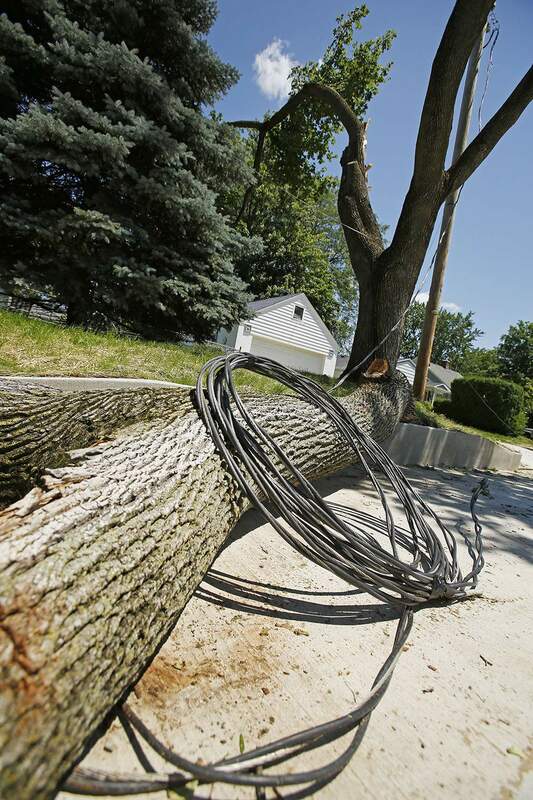 Chad Ryan | The Journal Gazette Coiled up power cables lie on a large tree limb on Sunday after the limb fell into Somerset Lane at Parnell Avenue during Saturday's storm. Indiana Michigan Power crews worked Sunday to restore electicity to the thousands of Fort Wayne area residents who were still without power due to Saturday's storms. More than 5,600 northeast Indiana I&M customers remained without power this afternoon after the weekend's storms, and flooding continued on several area rivers. As of 2:30 p.m., Indiana Michigan Power estimated 5,541 of its Allen County customers, or about 4 percent, were without power.The utility estimated 121 Huntington County customers, or 10 percent, had power out. Power has been restored to Noble County customers. I&M said it had restored power to about 80 percent of residents who had lost it. It said crews hope to have 95 percent restored by midnight tonight, and, weather permitting, full restoration is expected by noon Tuesday. To get a more specific restoration time, sign up for On the Go mobile alerts at https://www.indianamichiganpower.com/account/alerts. The utility said miles of wires are down, and 18 transformers, 69 cross arms and 56 poles need to be replaced. The National Weather Service forecast major flooding for the Tiffin River near Stryker, Ohio. It said moderate flooding was expected for the Maumee River in Fort Wayne, the St. Marys River near Decatur, the Maumee and Auglaize rivers near Defiance, Ohio and the St. Joseph River near Newville. As of 11 a.m. today, the Tiffin River was at 16.7 feet and rising near Stryker, the weather service said. Flood stage is 11 feet. The river is forecast to crest near 17.8 feet around 8 a.m. Tuesday and fall below flood stage around 3 a.m. Saturday. At 16.5 feet, major flooding occurs in and around Stryker. MAUMEE RIVER, FORT WAYNE: At 11 a.m. today the stage was 21.1 feet and rising. Flood stage is 17 feet. The river was forecast to fall below flood stage around 11 p.m. Thursday. At 21 feet, an increasing number of city streets begin to flood, the weather service said. Evacuations are necessary in Riverhaven, and numerous county roads are flooded. ST. MARYS RIVER. DECATUR: At 11 a.m. today the stage was 20.6 feet and rising. Flood stage is 17 feet. The river is forecast to crest near 21.3 feet around 2 p.m. Tuesday and fall below flood stage around 8 a.m. Friday, the weather service said. At 21.5 feet, high water affects U.S. 224, Piqua Road, Ohio 49 and east-side Decatur streets, the weather service said. MAUMEE RIVER. DEFIANCE. OHIO: At 7 a.m. today the stage was 18.8 feet and steady. Flood stage is 10 feet. The river is forecast to fall below flood stage around 6 a.m. Friday. AUGLAIZE RIVER, DEFIANCE. OHIO: At 11 a.m. today the stage was 23.5 feet and steady. Flood stage is 21 feet. The river is forecast to fall below flood stage around 10 p.m. Tuesday. At 23 feet, homes on Riverside Avenue begin to flood, the weather service said. ST. JOSEPH RIVER. NEWVILLE: At 11 a.m. today the stage was 14.2 feet and rising. Flood stage is 12 feet. The river is forecast to crest near 14.5 feet around 8 a.m. Tuesday. At 14 feet, significant flooding occurs on DeKalb County Road 42, and considerable agricultural and lowland flooding occurs along the river to Cedarville Reservoir, the weather service said. A crest of 14.6 feet occurred in May 2011.